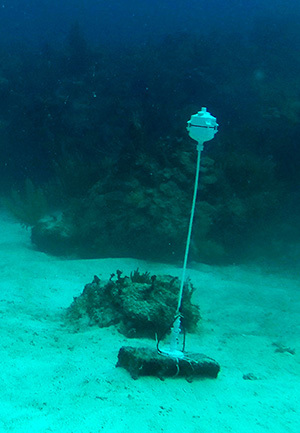 The hydrometric pendulum idea also works in a “float & anchor” configuration: allowing us to deploy them in open water environments. Early in 2011 it became clear that open-source micro controllers had the potential to replace expensive commercial sensor units with cheap & cheerful DIY equivalents. Provided someone was willing to dedicate themselves to this development. In January 2014, we started a small blog to record my attempt to build a simple water flow sensor using an Arduino. The project has grown since then, and we’ve developed those crude early builds into a generic data logging platform which can be configured for many different environmental monitoring applications. The basic 3-module design uses a ‘lowest common denominator’ approach, and this means any component in the build, including the Arduino itself, can be changed to suit the available parts without requiring a significant re-write of the operating code. Our performance benchmark is at least one full year of operation on three AA batteries, and with this logger as a foundation, we are deploying prototypes in wetlands, coastal waters and flooded caves. Although we are developing a ‘complete system’, rather than a single purpose machine, we are focusing on applications for hydrology research because of the crucial role water resources play in sustaining us, and connecting everything people do to the natural world. A three component logger forms the base unit, and the modules can be rearranged to fit into different housing shapes. Wow, I’m so happy to have come across this page. Thank you for your diligent documentation! I can’t wait to see how I can use this information. I especially enjoyed your writing on the inception of the project. Your blog is an outstanding source of technical information, ideas and links… Thanks for sharing! Wow, I can’t tell you how much I’ve been enjoying this blog. As a relatively recent “Maker” (and ham radio nerd) things like this have been extremely inspiring! Thanks for it and keep it up. Great blog. Motivated me to buy an Arduino and begin prototyping a pressure sensor for monitoring cave stream water depths. Curious: What temperature sensor would you recommend given your experiences? Thanks. To date I have been working with I2C breakouts (Sparkfuns tmp102 & Adafruits MCP9808) and one-wire DS18b20’s. All give you 0.0625C resolution but the MCP9808 gives a reasonably decent ±0.25 accuracy. The DS18s take quite a bit of calibration because there is a large amount of quality variation, but they have the strength that you can hook so many of them to very long wires. This multi-drop aspect of the DS18B20’s keeps bringing me back to that sensor over and over again. To be honest, all of them are ‘just OK’ as most of the caves we work in have less than 1 degree Celsius of variation all year. 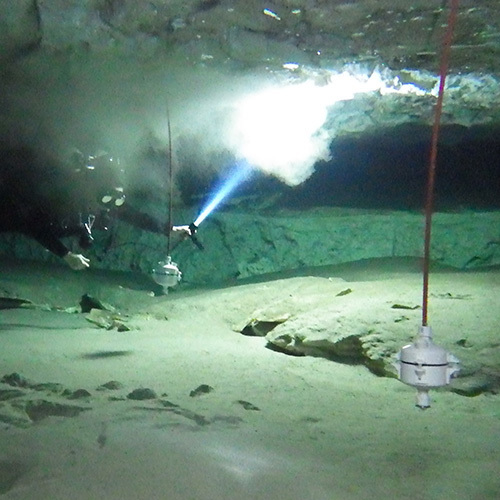 But what I really want for the cave work is an affordable sensor that can give me ±0.1C accuracy and 0.01C resolution. RTDs and Thermistors can deliver that but I have not had a chance to play with them yet. [Update] In 2017 I got the thermistors working at high resolution with better than ±0.2C accuracy . Thank You for Sharing Your Knowledge. Great blog , I’m never seen before. Thanks for your blog and sharing information. I’ll come back on it to search for Arduino information, power consumption reduction, sensors selection and epoxy pouring. For now, you just took 2 hours of my work day .. pfff. I’m glad you found it interesting enough to hold your attention. If it makes you feel any better, I loose hours myself every time I hit the Arduino.cc Sensors forum, and I am sure I have burned away many days worth of time at other blogs like Jeelabs or Felix’s site. Thank you! You are a big source of inspiration even to hardened engineers. The reading of the articles is a joy and also I learned a great deal for sensors calibration and what not. Also the density of information you provide is fantastic I truly consider this blog a Arduino university. If you need to deploy to Crete, I will be GLAD to help. Over a hundred caves in the island are waiting. Thank you for this inspiring blog. 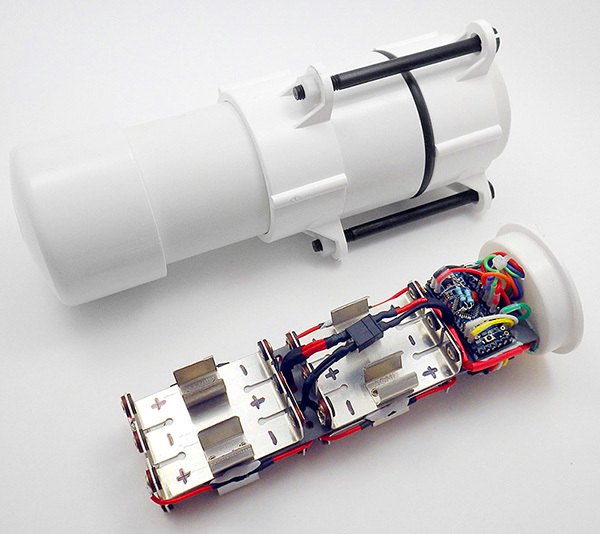 Do you happen to have any experience on coupling the pro mini with ultrasonic sensor to log stage height? 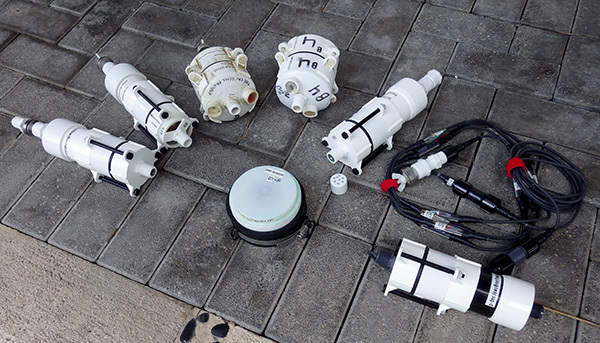 With our success on multi-month underwater deployments of MS5803 pressure sensors, and the recent work successfully putting them on 20m long cables, I have not had any pressing need for the ultrasonics yet. You could try contacting the folks over at the Oxford Flood Network, or take a look at Steve Hicks excellent work over at EnviroDIY. Have you updated the component list since? I am complete beginner in this field, however I rely on a robotics specialist in my university to able to reproduce your build and pair it with the maxbotix sensor. I stopped using the Polou power switch from those older instructions because it was drawing 0.25mA -which was more than the logger itself while sleeping. From the datasheet it looks like that the MB sensor will run on 3.3v, so be sure to select a pro-mini style board that runs at 8mhz/3.3v as this lets you connect the SD cards without a level-shifter. Also dig around for a library to control the sensors, as that will make your life a lot easier when you are just starting out. The basic datalogger script at on the Project’s Github gives you a code starting point, although it does not have any buffering, so it uses power with all the sd writing. what do you think of this Adalogger board? Hi Ed ! It is a very nice and impressive work you did ! And the amount and quality of environmental data is amazing. I’m Marine Biologist in Brazil and I am trying to develop one similar project to monitor both, intertidal rocky shore temperatures and some water variables like salinity, light, currents and others. My first step is to build a cable, using arduino and 12 DS18B20 sensors. I really appreciate if you could support me in this. I’ve summarized all the posts relevant to making a temp chain in a category on the upper right side of the page: Developing a Temp.Chain The first detailed build page covers the really important stuff. If you have more questions after reading through that, then please post them on that page as a comment – so others get the benefit of the answer too. The hardest part of the job is really the sensor calibration. We are looking at doing a data logger project for river monitoring. I just want to say this is an extremely well done blog that, through your generosity, will save us countless hours going down unnecessary rabbit holes in building a submersible pressure gauge. Thanks! Glad to help. Keep in mind that the MS5803 series sensors allow two configurable I2C addresses, so with the long cable configuration you can monitor barometric variation, and water level at the same time if you are near a dock, etc. And then the housing is even easier to make. I just want to say “thanks” for writting this blog. it is really interesting and fun to read. I like a lot your style and it very great to see real life arduino projects … and a very usefull project ! Always interested in hearing about a new board, but when I checked the MD-328D data sheet, the specs say only a 12-bit ADC. Although there are commands for things like analogRead_16bits() they capture only 125 sps. The slow sampling rate makes me highly suspicious that they are simply doing oversampling in software with the chips internal noise to provide dither. Since it is easy to do that with the 328P based boards to achieve higher ADC resolution, I would have to find another reason to try out the MassDuino. I’m building an underwater ambient light and temperature monitor for use on coral reefs and heavily relying on some of your housing construction tips. I know you’ve experimented with the DS18B20 waterproof thermometers for your temperature chain, but you replace their original cables. What have you found to be the most cost-efficient, corrosion and water resistant cable for long-term deployments? I’ll have cable lengths from 2 – 5 m, and will need the jackets to hold up in salt water for 6+ months. Any suggestions on a specific jacketed, 3+ core wire for this application? I have yet to hunt down a good cable supplier for long rolls. For now I’m using silicone jacket M12C-SIL-4-R-F-15 cable from Omega.com for shallow work, but I have only recently started testing it past 20m, and those units are still out on deployment so I don’t know if they will survive. For deeper sites I would recommend the tougher M12C-PUR-4-R-F-15, but it’s stiff, and coils enough to be annoying compared to the beautifully supple silicone cables under water. Both jacket types easily handle salt water, but at 300′, your biggest problem is compression of the cable jacket causing the cable to tear away from the epoxy that you potted the end connector in. It’s possible that cable glands would handle this better by pre-compressing the jackets, and I would look at the ones used by diving light suppliers or other high-end temp chain vendors. Gotcha, thanks for the link. As a new PhD student I’m looking to do this on a budget, so the silicone and polyurethane might be a bit out of pocket at the moment. Have you tested or considered a rubber-jacket SOOW or SJOOW service cable? The SOOW seems listed as waterproof, yet for some reason the SJOOW isn’t usually (despite still being labeled as waterproof via the second “O” in the name. An 18/3 cable is only about $0.50/ft so its budget friendly – if perhaps a bit big. Most are EPDM jacketed, same as our O-Rings so I’d think they’d be ok. Thoughts? I looked at service cables, but they are just way too thick for our work. Remember that most sensors barely draw 10-20mA. Also the PUR jacketed cable from omega is still cheaper on a per foot basis, and it’s really robust. Gotcha, I’ll give the PUR cable another look. From what I saw the webpage didn’t offer an option without the connector, making it about $1 / ft at the cheapest for 10m after shipping. It would be great to get it without the connector, I’ll call them. I can’t seem to find much on this and am a novice, but is there a reason why having low currents over a big cable (16 awg) would be a problem if its for short distances? No problem at all with the current, but as a general principle, I find that moving to smaller, lighter parts makes most aspects of building things easier when they are appropriate. For example, I almost always use tiny 1/8 watt resistors now, because they let me fit things into tight places more easily. But for your first prototypes I wouldn’t worry about it; just getting the darned thing working is an accomplishment! Edward, great and inspiring work! I built data loggers for my PhD based on your work and I was wondering how i may cite you or the Cave Pearl Project? Have you published these designs? When do you defend? We are getting an article ready for publication now, but fieldwork is also approaching so it might be mid summer before it actually gets submitted. Which provide links to PDF’s, build plans, etc. No rush, I’m probably gonna defend next year so I guess your paper will be out by then. I will check the presentations anyway. Thanks again for the everything! And Sensors is an open access journal, so it’s free for everyone to download the PDF. I just grabbed a copy of the pdf and will study it in detail! THANK YOU for putting all that information on the internet for free. Haven’t seen a more valuable source regarding logging with Arduinos, DS18B20’s etc. Congrats on your paper (open access wohooooo!) as well!!! Happy to help anyone with enough curiosity & gumption to build their own instruments! This project benefited from the hard work of so many people in the Arduino community, that we felt publishing in an open access journal was our way to “Pay it forward”. Cheers! Hi Ed, Thanks for such a brilliant blog. I’ve enjoyed every post. On Aug 12, 2017 you posted about EC probes. I was wondering if you ever got any time to get back to that project, or if you are aware of any simple, reliable solutions for measuring dissolved solids in water. I’m working with a group trying to do some monitoring of wells and springs around a new fracking injection well site in our community. I can put together the basic logger (which I will be using in a tensiometer project I’m doing), but I’m hoping for some guidance on the EC sensor. Any thoughts would be appreciated. Sadly I still have not had time to get back to the EC work but it’s penciled in for November. The Atlas EC kits are probably your best bet if you are relatively new to the Arduino game as you should be able to find plenty of people working with them in hydroponics / aquarium land. If you’ve a bit more electronics background then the 555 Timer based circuits have a great following on Publiclab & there are plenty of tutorials. The trick is getting some good probes, and for fresh water I’d start by re-purposing one from a used Vernier kit off of eBay – though if you go that route you might as well use their circuit too since they output a voltage signal you can read directly with the ADC – same goes for the thermistor that’s embedded in the probe. Thanks for the quick response. The Atlas EC kits look great, but we need to put out 20+ to cover our area and that’s not in the budget. Looks like I’ll have to bump up my electronics skills. I’ll keep watching your site for inspiration. this is a great website with plenty of information and inspiration. Thanks for giving us insight of your work. I’m interested in monitoring springs as well and there is also a karst spring nearby. But I’m no diver and the only thing that I can think of is temperature for little springs. I was thinking of measuring flow rate with ultrasound, but professional sensors are expensive and there seems to be no easy way to build them. So I will monitor the water level of the stream flowing from the larger springs. Remember the old fashioned methods still work! If you can set up a V-weir, then level alone will give you the ability to estimate volume/velocity. We’ve been very happy with the performance of the MS5803 pressure sensors for water level, once they are potted in epoxy. Regarding absolute temperature calibration of sensors. Thought you might enjoy. I found an interesting article by Robert Smith (http://www.kandrsmith.org/RJS/Misc/Thermometers/absolute_ds18b20.html – “Absolute Calibration of DS18B20 Thermometers”). He found that using the melting point of ice (“ice bath”) and melting point of gallium, he could establish a two-point linear calibration. After calibration, he could recover better than 0.05C temperature scale. Gallium is pretty inexpensive and safe to work with. I’ve been using a basic cheap hotplate magnetic stirrer, and modified the heater to use one of those cheap heater controllers. The technique works well for the One-Wire sensors, but it should work equally well for any sensor like thermistors as well. Re amalgams. I’ve been wrapping bundles of sensors tightly in cling wrap before I dip them in the gallium, so there is no metal-metal contact. How much did you have to buy to get enough volume to dip sensors in? 200 grams? I’m using 100 grams in 25 mm plastic test tubes. That’s enough gallium to fill ~1.5 inches of the tube. I can fit 4-5 DS18B20’s in there as well, which displaces the liquid.